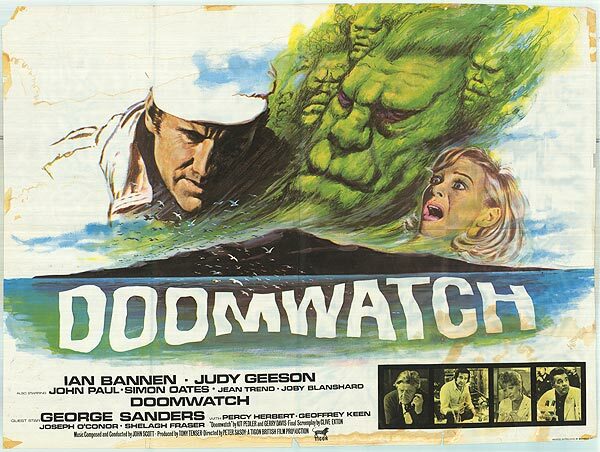 Based on the hit BBC series 'DOOMWATCH' which ran from 1970 -1972 (reviews for series 1, series 2 and series 3) which followed a government environment monitoring organisation, this Tigon British film production would carry on what the T.V. series started but push it one step further. Much like the T.V. 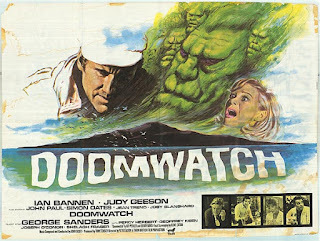 series the feature film would focus once again on the effects mankind has on the environment and what 'DOOMWATCH' can do (if anything) to stop it. Doctor Del Shaw (played brilliantly by Ian Bannen) is sent off to the island of Balfe to investigate the effects of an oil tankers spill on the fishing village, but while there he discovers that it may not be just the waters that are contaminated but the villagers themselves. After being given the cold shoulder from the villagers due to him being an outsider he finds some comfort in local teacher Victoria Brown who explains that they have their own ways on the island. His comfort is short lived though as he discovers a body in the woods and is attacked by someone or something in an abandoned building. Quickly realising he isn't wanted there he sends his local samples of plants, animals and sea creatures off to the Doomwatch team to look into. What they discover explains why the men folk on the island are so aggressive and also why they look so abnormal. It appears not only has the military been dumping radioactive waste in the waters surrounding the island but so has a dumping company hired by a chemical company to get rid of their growth hormone chemical that is more dangerous then they expected it to be. Now with the island cordoned off by Doomwatch and the military, will the villagers be saved or will their very existence on the island be over? Directed by the very capable Peter Sasdy who had already at the time of directing the 'DOOMWATCH' feature film had notable credits with Hammer's 1970 film 'TASTE THE BLOOD OF DRACULA' and the two 1971 films 'COUNTESS DRACULA' and 'HANDS OF THE RIPPER'. Fans of the series will be glad to hear that the team led by Dr. Quist is on hand if only on a smaller scale. Some impressive prosthetics are used for the abnormalities on the villagers which puts to shame the use of cgi in modern day films. For those that have never seen an episode of the series this feature film would be worth checking out and can easily be watched without knowing anything of the classic BBC series. Much like every episode of the T.V. series this also has a message running throughout which still resonates today, and just like the cult status of 'DOOMWATCH' will only grow as time goes on.